Samunnati Nataliya Lehonkova of the Sri Chinmoy Marathon Team won the Toulouse International Marathon in France on October 29th. Amidst extreme weather conditions including a temperature of 3 degrees Celsius, she set a new personal best in a time of 2.38:22. Samunnati hails from Ukraine and is the fastest female runner in the international Sri Chinmoy Centres. Earlier this year she won the marathon in Edinburgh, Scotland. When running she tries to invoke spiritual energy to help her in the race. Samunnati says she is inspired by Sri Chinmoy’s deep love of running. 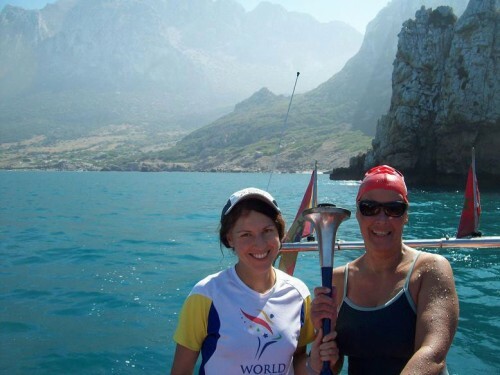 Vasanti (right) and her assistant Albena hold the Peace Torch after a succesful crossing. 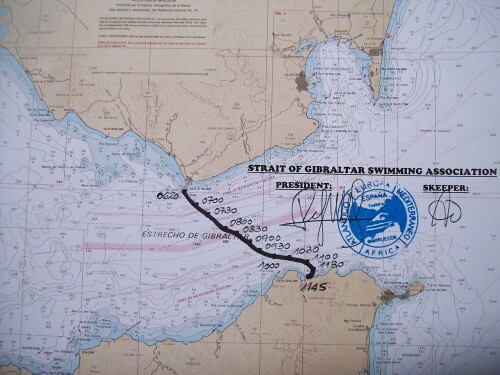 Vasanti Niemz, a two time English Channel swimmer and ultra-triathlete from the Sri Chinmoy Marathon Team Germany, has recently swum across the Gibraltar Straits, the body of water separating Spain from Morocco. Vasanti completed the 14K (8.7 mile) swim under favourable conditions in 5 hours and 25 minutes. 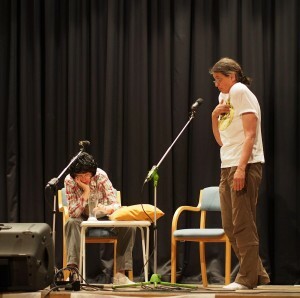 She was assisted by Albena Margaritowa from Edinburgh. Vasanti’s Gibraltar crossing was a dream come true. She dedicated the swim to the 25th anniversary of the World Harmony Run, a global Torch relay for peace founded by Sri Chinmoy. 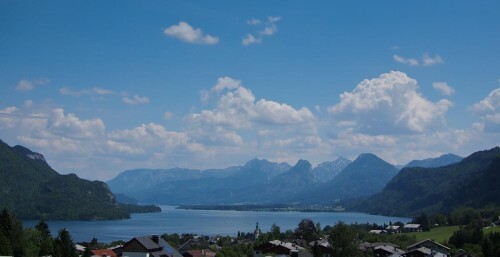 Last weekend 500 of Sri Chinmoy’s students from all over Europe attended a ‘Joy-Day’ in the small town of Mondsee in Austria. Surrounded by the breathtaking mountainous scenery they shared three days of joyful and spiritual activities. The Joy-Days were created by Sri Chinmoy’s as a means to share the joys of the spiritual life and to be able to experience the power of group meditation. Aside from the regular meditations there were many recreational activities, such as waterskiing, golfing, horseback riding and archery. The evenings were reserved for enlightening and entertaining program items, like music, theatre and inspirational video’s. 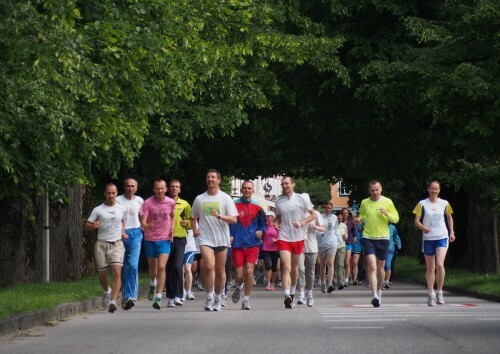 In the morning a 5K race was organized around Lake Mondsee. Running together is always a joy! Samunnati Nataliya Lehonkova from the Sri Chinmoy Centre in Ternopilska, Ukraine, has won the Edinburgh marathon last Sunday May 27th. Under warm conditions and on a hilly marathon course Samunnati completed the race in 2:39:46. It was her second marathon win in her running career, after a win in Poland in 2010. Also it was her second marathon in 6 weeks, after she had placed second in the marathon of Utrecht (The Netherlands) last April in a personal best of 2:39:20. She commented that now she will take some well-deserved rest. During the race members of the Sri Chinmoy Centre in Edinburg cheered her on. 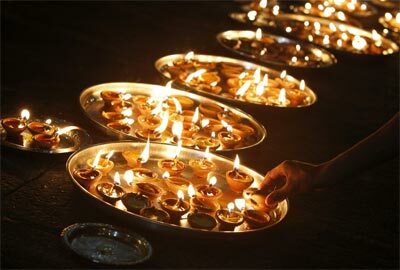 In the evening they celebrated her victory at their Sunday night meditation. Every Sunday morning the Sri Chinmoy Centre of Seoul in South-Korea offers free meditation classes for the public. The classes are given in a yoga studio and are attended by about 40 people. 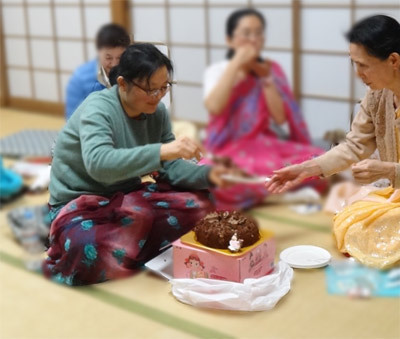 The classes are given by Hemabha, who also initiated the Seoul Sri Chinmoy Centre. Hemabha was born in Korea, but then moved to London where she became a student of Sri Chinmoy. She recently moved back to her home country. To celebrate Sri Chinmoy’s arrival in the West in April 1964 the Nepalese Sri Chinmoy Centre in Kathmandu organized a day of special celebrations. This ‘Joy-Day’ consisted of joyful and spiritual activities, such as meditation, singing, a spiritual play and a visit to Sri Chinmoy’s statue in Nagarkot, at the foot of the Himalaya’s. At the Joy-Day there were also four disciples from Bangladesh, which is Sri Chinmoy’s land of birth. One of these students is doing her PhD thesis on Sri Chinmoy’s poetry. Music from Nepal – report about Songs of the Soul concert in Kathmandu. Sri Chinmoy encouraged students from different countries to meet together for Joy Days – gatherings of meditation and spiritual practice, but also games and (as the name suggests) joy! Recently, Japanese and Korean students met together in Japan for the first such Joy Day. (Left) Hemabha from Korea celebrates her birthday. (Right) some of the afternoon games. There are now plans for the first Asian Joy Day later on this year. Last weekend, 500 of Sri Chinmoy’s students from all over Europe convened in the South of Germany for an uplifting weekend of meditation, sports, music and other inspirational activities. True inner joy is self – created. This divine joy is the sole purpose of life. Sri Chinmoy aptly called these events a ‘Joy-Day’. 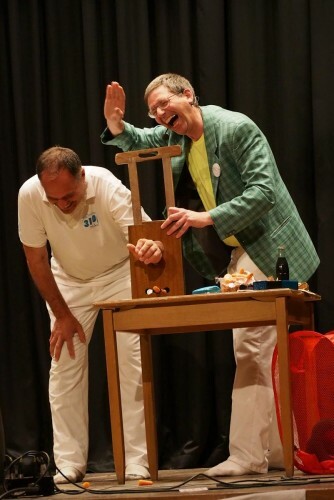 This Joy-Day took place in Weinheim, near Heidelberg. Most people arrived late Saturday afternoon; after an opening meditation and dinner there was a versatile spiritual evening program with music, meditation, video’s, slideshows, a play and news about all the activities of the Sri Chinmoy Centre in various parts of the world, such as the recent concerts of the Gandharva Loka Orchestra in Bangladesh. Sunday morning started with an early 6 a.m. meditation followed by a 2-mile running race. After a late morning program with more music, singing and video’s the Joy-Day ended with a final silent meditation. The latest edition of Inspiration Letters focuses on the topic of luminaries, and includes a selection of thoughtful articles on inspirational people. Pranavanta John Montefiore, a student of Sri Chinmoy, was an exceptional artist who developed a strong reputation for his innovative and marathon artworks. Pranavanta became a meditation student of Sri Chinmoy in 1985. Studying under the tutelage of Sri Chinmoy (who himself was an artist) gave Pranavanta artwork a renewed spiritual energy. A tribute to his life was recently published in the Sydney Morning Herald. …Montefiore was an aficionado, someone who could wax lyrical on many aspects of the world: not just the beauty that he strived to portray in his artwork but also the sweet sounds of music, the aroma of a flower, even the joy of a terrible pun. Montefiore’s altarpiece in Christ Church Cathedral, Newcastle. 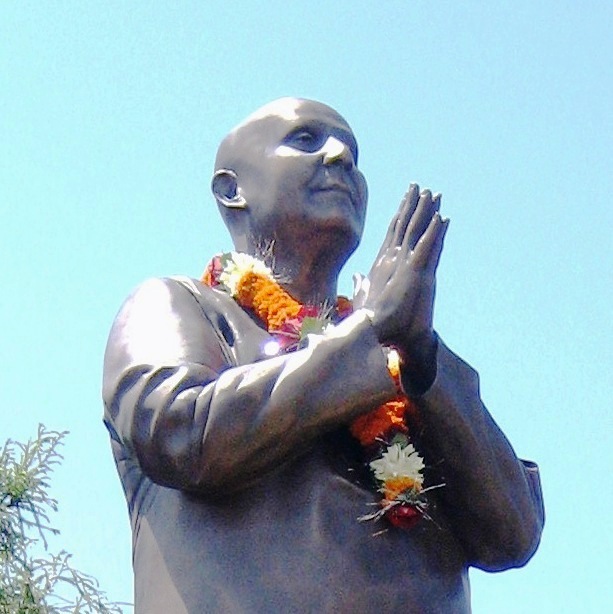 Since Sri Chinmoy’s mahasamadhi in 2007, Kaivalya Torpy, a student of Sri Chinmoy has produced several statues of Sri Chinmoy which have been placed in different parts of the world. Kaivalya is actually a trained scientist who worked as a physics teacher in London. 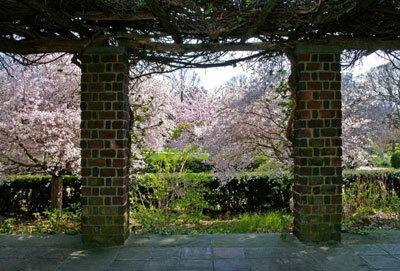 However, encouraged by his Guru, Sri Chinmoy, he become more involved in sculpting several years ago. 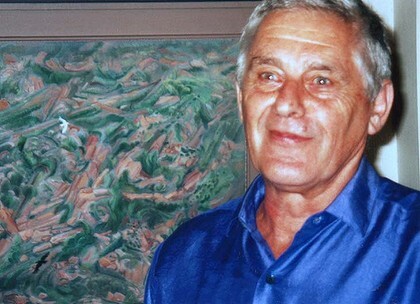 In this interview he explains how he feels Sri Chinmoy’s inspiration as he works on his art. 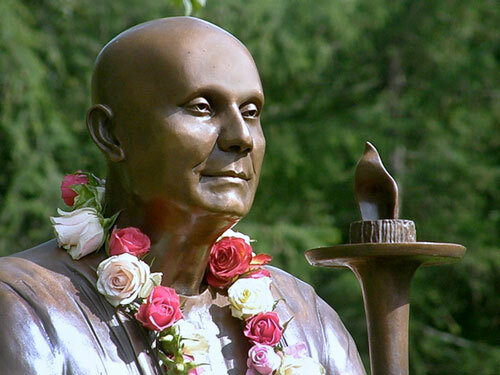 Life-Voices 33 Statues of Sri Chinmoy, produced by Kedar Misani.